Now perhaps some of you will be surprised to hear … but the weather was horrendous! Whilst we are both used to the English weather, neither of us were expecting torrential rain with gail force winds! We therefore decided that our driest option would be at the aquarium, where six million tons of water is contained behind glass! 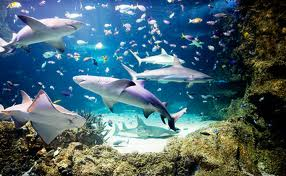 Located in the heart of Sydney at Darling Harbour, the aquarium is one of the world’s largest and is home to over 13,000 animals. Two of these being 'Dugongs' which I was looking forward to meeting! After some lovely fish we then met some rather creepy 'Japenese Spider Crabs', these crabs are giants! Apparently their claws can grow 4m claw to claw. I definitely do not fancy meeting one of these out in the sea anytime soon! Next up was the endangered 'Dugongs' apparently there's only 6 left in the entire world! A personal favourite of mine, considering there size they were so cute! Last up was the sharks, safe to say they definitely saved the best till last! Themed as the 'Great Barrier Reef' it's a massive walk through tunnel! I don't think either of us had ever seen so many sharks! It's made me want to swim with them even more now! Overall the aquarium was by far the best I have ever visited. Whilst it had all the usual fish you would expect to see, the last tanks with the dugongs and sharks easily make it the best. Hey, Dugong, who ate all the pies??!! !